Happy Chinese New Year! Goodbye Year of the Rat, Hello Year of the Ox. 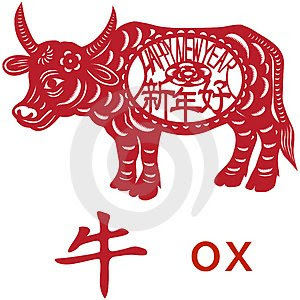 The Ox symbolizes responsibility, dependability, honesty, practicality and industriousness. I work with many companies in China, and this two-week celebration is a very auspicious (as many of my coworkers would say!) time for them. The country basically shuts down for two to four weeks as workers travel home to their families, many of whom live in rural China. The traditional gift at Chinese Spring Festival (as it is called by the government) is money tucked into red envelopes. As red is the color of luck, you'll also find red decorations, lanterns, and banners throughout the streets and shops.